In February 1918, the Admiralty issued a production order to Blackburn Aircraft, an experienced aircraft manufacturer. Blackburn delivered its first T.1 in May 1918. The aircraft immediately experienced undercarriage and tailskid failures, requiring redesign of those components. The T.1 also required an enlarged rudder and offset vertical stabilizer to combat its tendency to swing to the right. Fairfield and Pegler finally began production in August and October, respectively. After undergoing service trials at RAF East Fortune, the T.1 was recommended for squadron service. Deliveries to the Torpedo Aeroplane School at East Fortune commenced in early August 1918. Training took place in the Firth of Forth, where Cuckoos launched practice torpedoes at targets towed by destroyers. Cuckoos of No. 185 Squadron embarked on HMS Argus in November 1918, but hostilities ended before the aircraft could conduct any combat operations. In service, the aircraft was generally popular with pilots because the airframe was strong and water landings were safe. The T.1 was easy to control and was fully aerobatic without a torpedo payload. The Arab engine proved unsatisfactory, however, and approximately 20 T.1s were converted to use Wolseley Viper engines. These aircraft, later designated Cuckoo Mk. II, could be distinguished by the Viper's lower thrust line. The Arab-engined variant was designated Cuckoo Mk. I. The Cuckoo's operational career ended when the last unit to use the type, No. 210 Squadron, disbanded at Gosport on 1 April 1923. The Cuckoo was replaced in service by the Blackburn Dart. 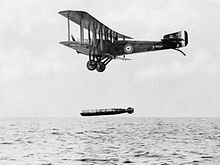 Throughout 1917, Commodore Sueter proposed plans for an aerial torpedo attack on the German High Seas Fleet at its base in Germany. The carriers HMS Argus, HMS Furious, and HMS Campania, and the converted cruisers HMS Courageous and HMS Glorious, would have launched 100 Cuckoos from the North Sea. In September 1917, Admiral Sir David Beatty, commander of the Grand Fleet, proposed a similar plan involving 120 Cuckoos launched from eight converted merchant vessels. Today, no complete Cuckoo airframe survives, but a set of Cuckoo Mk. I wings are preserved at the National Museum of Flight in Scotland. Main production variant. Powered by a 200 hp (149 kW) Sunbeam Arab engine. Mk. I converted to use a 200 hp (149 kW) Wolseley Viper engine. Prototype powered by a 275 hp (205 kW) Rolls-Royce Falcon III engine. Single-seat bomber powered by a 200 hp (149 kW) Hispano-Suiza 8 engine. Two prototypes built. Imperial Japanese Navy Air Service - Operated six Cuckoo Mk. II aircraft. ^ a b c d e Davis 1999, p. 123. ^ a b Robertson 1970, p. 125. ^ Davis 1999, p. 122. ^ a b c d Robertson 1970, p. 127. ^ a b c d e Thetford 1978, p. 318. ^ a b c d Layman 2002, p. 191. ^ Layman 2002, p. 192. ^ Thetford 1978, p. 319. Wikimedia Commons has media related to Sopwith Cuckoo.